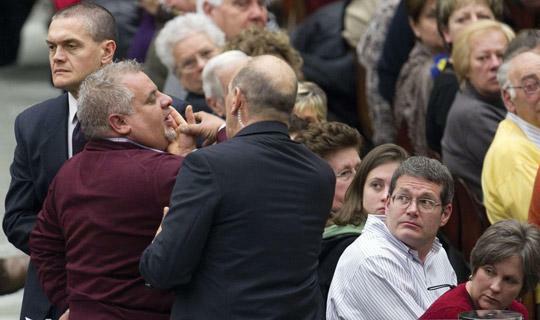 Anġelik Caruana, the Birżebbuġa man who claims to have visions of the Virgin Mary, yesterday caused a stir at the Vatican when he and another Maltese man left their chairs and shouted to the Pope during a general audience. Italian news agency Ansa reported the two tried to jump over the barriers to get to the Pope during the weekly Wednesday audience but were stopped by security personnel. It could not be confirmed what the two were after, however, it is understood such behaviour by people present for the general audience is not unusual. Vatican spokesman Fr Federico Lombardi said “there were two people who raised their voice and wanted to give a letter to the Pope containing devotional messages. That’s all”. He said that after being questioned by the gendarmerie, the two were allowed to remain for the audience as they were “good people” and were “no threat” to the Pontiff. “People close to the barriers at times get on the chair so they appear taller but this doesn’t mean they want to jump over,” Fr Lombardi said. Worse things have happened to this Pope. In 2009, Pope Benedict was pulled down to the ground by a woman who jumped over the barrier during Christmas Eve Mass, with French Cardinal Roger Etchegaray, 87, falling and breaking his leg in the incident. According to a spokesman for the group that gathers at Borġ in-Nadur, where the visions are reported to happen, Mr Caruana did not try to jump over the barrier but stood up and called out to the Holy Father “Santità!” and waved a sealed letter he wanted to give to the Holy Father. Mr Caruana claims also to receive messages from Our Lady, which are then published on the group’s website www.borgin-nadur.org. Fr Lombardi confirmed the letter Mr Caruana was holding, which will be “examined with due respect”, contained devotional material. The Maltese Church has yet to take a stand on the reported visions and messages. Fr Lombardi said such matters were not usually decided by the Vatican and depended on the local bishop for approval.